In a homecoming of sorts, Hall of Fame basketball player and former Lakers star Shaquille O’Neal opened his first LA restaurant last week on February 1. 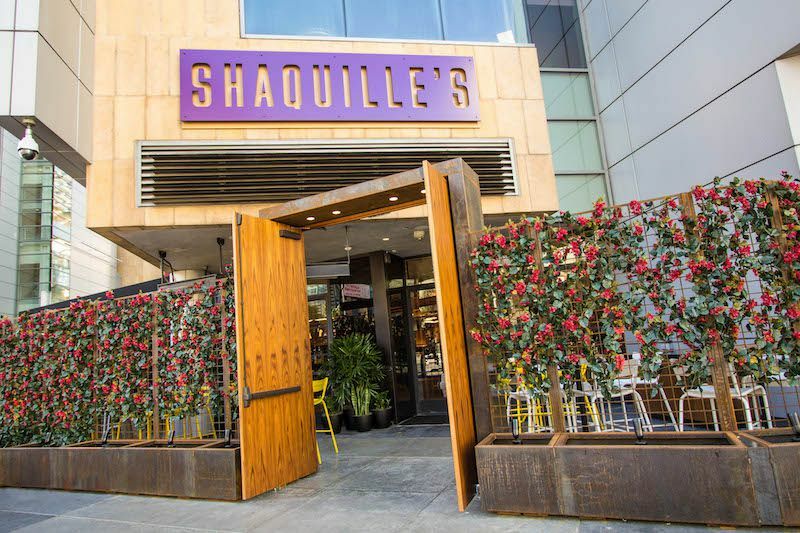 It’s impossible to miss, with giant doors and a prominent purple Shaquille’s sign at Downtown’s L.A. Live project, right next to Staples Center where The Big Diesel helped deliver three NBA championships. The team describes the restaurant as “Southern hospitality with modern flair.” And while there are fried green tomatoes, shrimp and grits, mac and cheese, and corn pudding on the menu, most of the entrees are pretty standard fare with pan-roasted salmon, roast Jidori chicken, flat-iron steak, and shrimp ceviche. There are only two burgers on the menu, a Shaq cheeseburger and an actual Kobe burger. Behind the bar, only Southern California beers are on tap. Modern and classic cocktails are available, with a wine menu that spans across most wine-making regions. Shaquille’s took over SBE’s former Cleo space, which closed in May 2018. As most would imagine with O’Neal’s involvement, there’s reserved seating for celebrities, and a table with a Shaq-sized chair. Shaquille O’Neal’s business ventures go far beyond basketball, with a recent focus on restaurants. O’Neal debuted the Big Chicken restaurant in Las Vegas last October, accompanied with a Facebook video series called “Big Chicken Shaq” which tracked the restaurant’s progress before the opening. Hours are Sunday through Thursday from 11:30 a.m. until 10 p.m., and stays open until 11 p.m. on Friday and Saturday. “Shaquille O’Neal Just Opened a Big Comfort Food Restaurant in Downtown Los Angeles.” Eater LA – All. https://la.eater.com/2019/2/11/18220652/shaquille-oneal-opening-restaurant-nba-los-angeles.